Friday's attendance at Golden West was small, only about 30% of last year's Saturday attendance. But then I didn't see last year's Friday, so here's hoping that it's up today. Two Harriers and two F/A-18s gave a good show, as always, and you had to keep one eye on the sky for the frequent fly-by of something out of the ordinary including a U-2 and a C-130. The real interest on the ground, though, was the number of LSAs being shown. 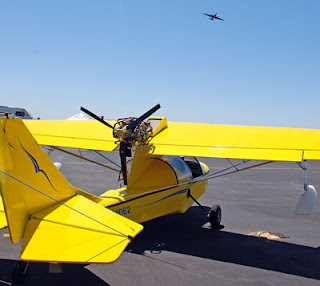 There were quite a few new and interesting aircraft even though the on-the-wheels versions were all in the $120,000 range. That's still too pricey for my pocket and, probably, a lot of others' given the news from Wall Street et al. If civil aviation is to avoid becoming un-civil, the path will be led by the homebuilders. The expansion of computers and glass got a boost with the display by Vertical Power. 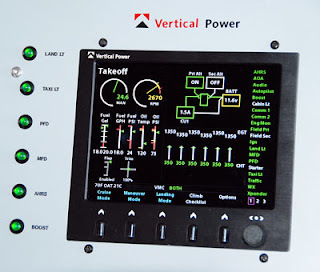 Where the market is nearing glut-stage vis-à-vis flight instruments, Vertical Power is looking inward to examine the health of the aircraft. The display goes beyond listing the voltage in each circuit; it starts by displaying a check list tailored to each portion of the flight and, similarly, displays the appropriate system. For instance, when starting the engine, oil pressure and rpm take the fore. Taxi mode puts those away and displays cylinder head temperature. Takeoff mode brings up manifold pressure. Similarly, all the electrical parameters are displayed with diagnostics and alarms that certified aircraft can only dream of. What the customer receives is a package consisting of a display and a black box (it's actually red) weighing only about 5 pounds. While not entirely plug and play, it does make the installation substantially easier in that the circuit protection is entirely within the system and is all solid state. If you're at that stage of building where the fear of wires is looming large, surf on over to Vertical Power to take a close look. Also of interest, even if you're not scratchbuilding, is the display by Stewart Systems. They're showing a method for both covering a fabric aircraft and then painting it. No stitching for the former and no smell for the latter make this an especially easy procedure. We'll be testing this paint in an upcoming issue of KITPLANES. Stewart Systems requires the same stitching as any of the others. But you're right about the low-stink factor.